We would like to thank all of our users who have reported problems and made suggestions for improving this release. In particular, we thank Surendu Korgaokar, Tom Rutherford, Stefan Vigerske and Rich Roberts. As announced earlier we dropped the following systems as of this GAMS Distribution. GAMSBAS: The newer savepoint/loadpoint facility is easier to use and more robust. As announced in the 22.9 release notes we dropped the following solvers as of this GAMS Distribution. CONOPT1 (old version of CONOPT). The default CONOPT version, CONOPT 3, will not be dropped. MILESOLD (old version of MILES). The default MILES version will not be dropped. OSL1 and OSL2 (old versions of OSL). The default OSL version will not be dropped. PATHOLD (old version of PATH). The default PATH version will not be dropped. CONOPT 2 (old version of CONOPT). The new Gurobi solver provides state-of-the-art simplex-based linear programming (LP) and mixed-integer programming (MIP) capability. The Gurobi MIP solver includes shared memory parallelism, capable of simultaneously exploiting any number of processors and cores per processor. The implementation will be deterministic: two separate runs on the same model will produce identical solution paths. 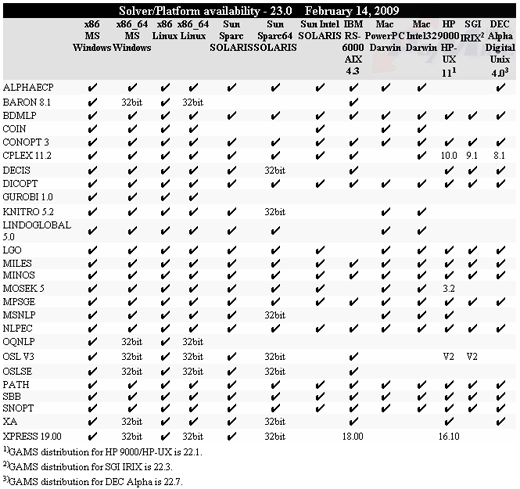 The Gurobi solver is available for the 32-bit and 64-bit versions of Windows and Linux. Please contact us for an evaluation license. The primal algorithm has been improved and is now 40% faster on XPRESS' LP benchmark test set and 20% faster on XPRESS' large LP benchmark test set. The dual algorithm has been improved and is now 22% faster on XPRESS' LP benchmark test set and 45% faster on XPRESS' large LP benchmark test set. Support of GUROBI as an in-core communication solvers. Where a traditional link already exists, the newer in-core link version has a “D” appended to the name (D for DLL). These in-core links are very similar to their traditional predecessors. They may lack some functionality but offer in-core communication between GAMS and the solver, making potentially large model scratch files unecessary. This can save time if you solve many models in your GAMS program.